Resort Fees of $15 per townhome per night stay will be collected at check in for access to Gated Community and Amenities! Front Desk is open 24 hrs. Resort Indoor Amenities: Open 8 a.m. to 11 p.m. 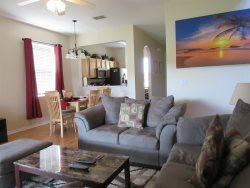 The townhomes are located in a Gated Community. The gate is monitored by a Guard 24 hrs for access assistance. Early arrivals ~ Pre-Registration begins @ noon. You may come fill out registration, pay resort fees and enjoy the pool until check in time. Late check outs are subject to property availability and must be approved 24 hrs in advance to check out date. You are also welcome to use the resort until 11 p.m. on departure date. EXPEDIA Ticket desk is conveniently located in lobby for all your attraction ticket and dinner show needs from 8 a.m. to 4 p.m.
You may have mail and packages delivered during your stay to the front desk. There is a holding fee of $5 per parcel (20 lbs. and under) & $10 (21 lbs. and up).